As must be evident from Varsha’s innumerable posts, Sunday meals at our house is always special, generally some authentic Goan fish preparation and seldom chicken. I have given up eating non-veg since a very long time. To compensate, Varsha always tries to make some vegetarian preparation for me. This is an impromptu recipe that we came up with. 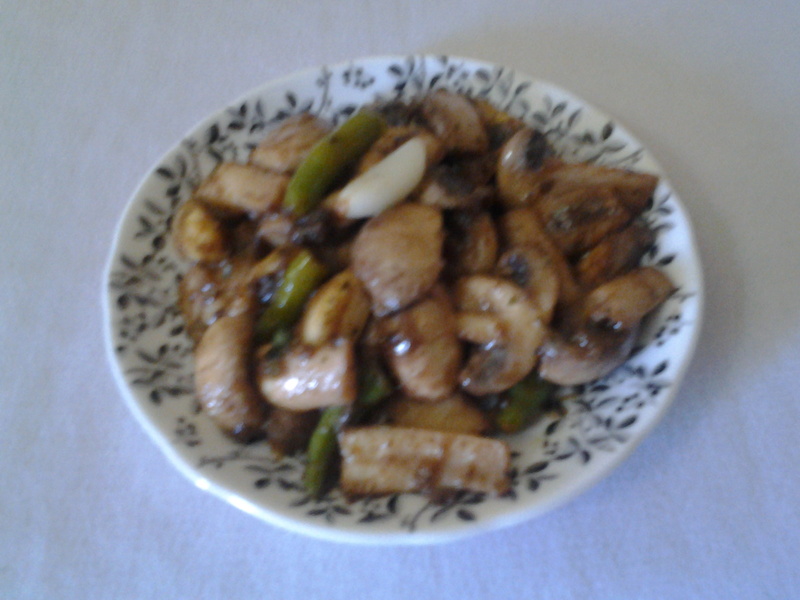 Preparation time less than 15 minutes flat, therefore the name “Quick Chilly Mushroom”. Wash and clean the mushrooms and cut them into 2-3 pieces each, length-wise, ensuring there is a little bit of stalk and bulb with every piece. Squeeze a lime and set aside. In a small bowl mix ginger garlic paste, pepper powder, vinegar and Soya sauce. Apply this mixture to the already cut and lemon soaked mushrooms. In a hot pan put the ghee. Once the ghee melts add the chillies (make only 2-3 pieces of a chilly) and the garlic cloves (whole cloves with the skin). Let the flavours start mixing. To this add the cut mushrooms. Cook initially on a slow flame for 5 minutes. Stir occasionally. Mushrooms tend to get cooked soon. To this add the corn flour. If you feel the preparation sticks excessively to the bottom of the pan, feel free to add some ghee. Serve hot as a starter/side dish. Posted on March 31, 2013 by Varsha	• This entry was posted in Starters, Uncategorized, Veg Side Dish. Bookmark the permalink.